One might think that after watching the hilariously funny production of Ken Ludwig’s “Moon Over Buffalo” at North Coast Repertory Theatre (through Feb. 10) that someone is feeding the cast some special cool aid, it’s that hysterical. Ludwig, whose “Crazy For You” and “Lend Me a Tenor” and just recently “Robin Hood” (premiered at the Globe last year) is a two time Tony nominee and recipient of the Lawrence Olivier Award. “Moon Over Buffalo” opened on Broadway in 1995 and starred Carol Burnett. “Buffalo” takes place in 1953 when TV was making inroads into the home and road theatre was on the way out. “Moon Over Buffalo” is all about the backstage shenanigans of an over the hill acting couple, George and Charlotte Hay, (Arthur Hanket and Katrina Ferguson play beautifully opposite each other) whose love of and for the theatre drives them into performing, “Cyrano De Bergerac” and Noel Coward’s “Private Lives”, in repertory, at The Ertanger Theatre in Buffalo, N.Y. Rather than hanging it all up and retiring they are committed to pursue their love of acting even in the face of bankruptcy. 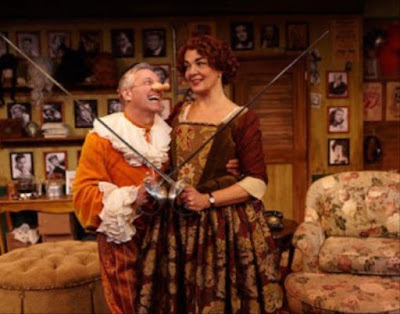 In the dressing rooms where all the hysterics, histrionics and real life bickering goes on unseen by the majority of the audience, the ‘play’s the thing’ is being acted out in the front of the house where eventually some missteps from the their 'private lives' spill over on to the viewing audiences. 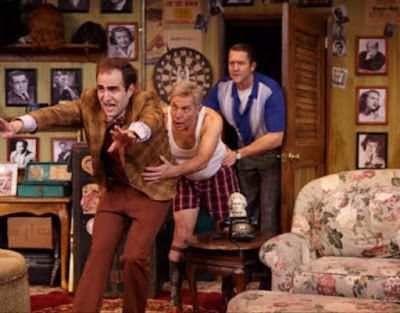 This particular backstage farce has all the ingredients necessary for the physical as well as the low humor and running gags needed for such a piece: a rotating set with Marty Burnett's five door revolving stage keeping the action moving at two paces; fast forward and faster forward. Costumes fall apart by design, (Elisa Benzoni is a genius at this) a hard of hearing grandmother (Roxanne Carrasco) who hates her hearing aids, love gone awry on all fronts, lots of missed cues, (lighting by Matt Novotny) and lots of slamming doors, even the one with a bell that rings every time it’s opened and closed. (Melanie Chen Cole). There is no question that this gig might be the Hay’s last hurrah. They hope to be saved from mounting debts and shrinking audiences when they learn that Frank Capra is coming to town to take a look at them for a possible role in the movie “Lost Horizons” where Ronald Coleman the lead, fell at rehearsal and broke a few bones making him somewhat impotent to go on. This leads to mistaken identities, miscommunication, lack of communication, too much communication, accusations, melodrama and a terrific drunk scene by Hanket (Five star performance that almost dun him in) that brought the house down the day I was there. It rev's up the action and pushes this little farce as far as it can go. With the help of some fine supporting actors, the play leaps out from every door. 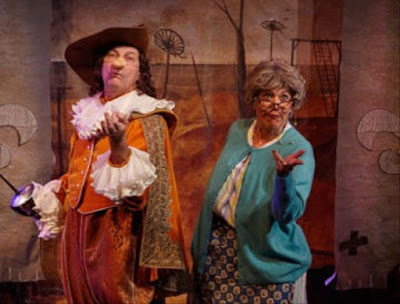 Roxane Carrasco is a hoot as the stone -deaf mother-in-law, Ethel. The Hays’ daughter Rosalind (Jacque Wilke is always a find) has given up acting as well as her last beau, Paul (Josh Braaten) who still hasn't figured out what happened between the two. She returns to the scene of the crime to introduce her new fiancée Howard to her parents. Braaten is also part of the acting ensemble in the play within the play and fits right in. Howard, (Arusi Santi) turns out to be the weatherman on a TV station in Buffalo. He also has a deer in the headlights look about him, or perhaps he’s just in a fog with all the mishagas going on. And lest we forget the ingénue, Eileen (Brittney Bertier) who is not so secretly having an affair with George and announces she is well…pregnant. 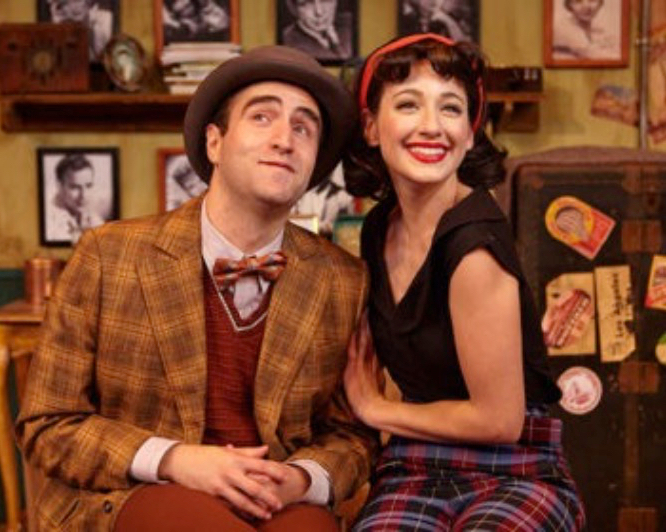 Charlotte’s loath of George's infidelity feeds into her need to run away with Richard (Matthew Salazar-Thompson), The Hay’s attorney. 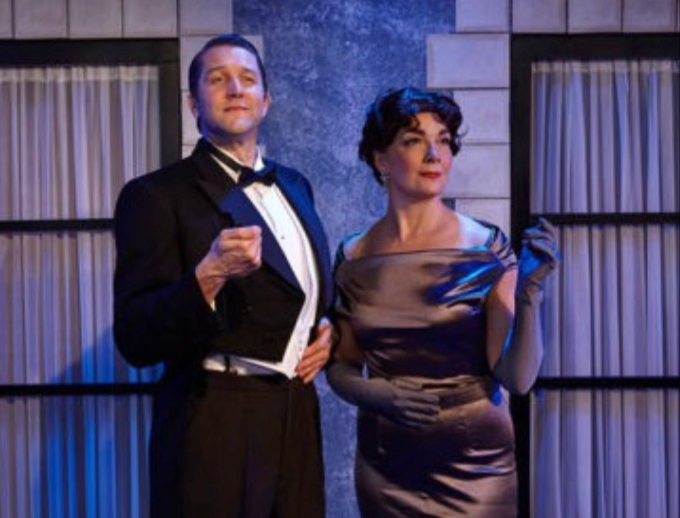 Thompson's looming presence, without much dialogue (but if you read faces), says volumes…and his look reads success dressed in Ms. Benzoni’s stunning period look suit and shoes. Right on! As an ensemble piece every one of the players and every over the top scene with every move played to please under director Matthew Wiener’s keen eye for comedy, is physical, multi-layered, wonderfully comic, spot on perfect. If you are looking for some fun and you like farce, try this one. It plays through Feb. 10th.